Remember when the tree came down this spring? 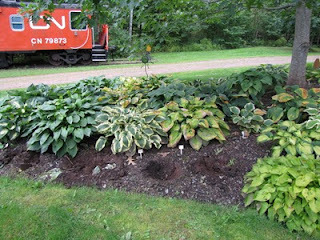 ﻿I had all my mini hosta around the front of the tree. The spruce had provided enough shade for them, but now, I wasn't so sure. Looking back I did quite a bit of plant moving this year. 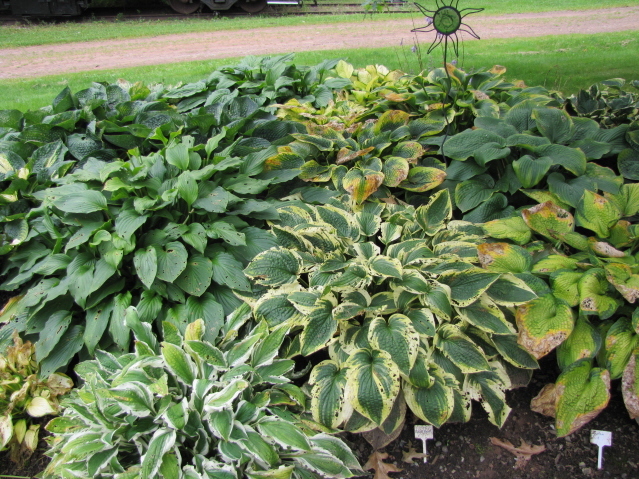 So out came the mini hosta this spring. I was just making more work for myself. 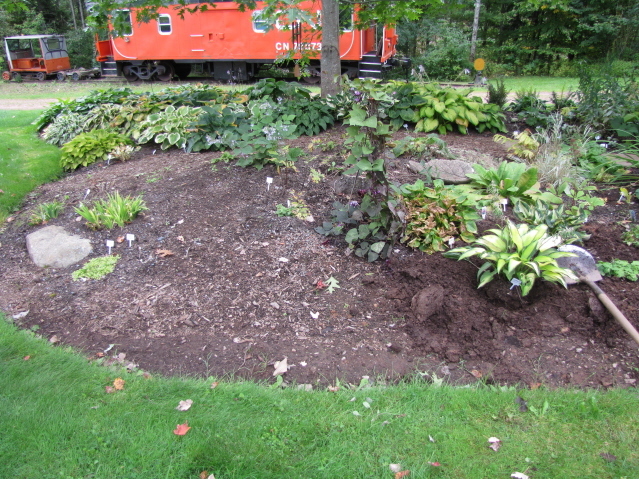 The ferns, lungwort and a few other assorted plants were moved out to the edge of the bog making room for a mini hosta bed. I had, of course, added to my collection﻿. 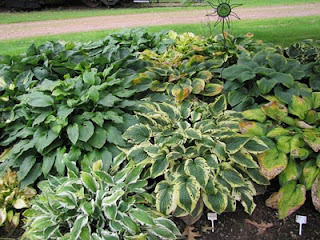 So no mini hosta, no tree. What to put there. Andrew and I talked about adding another tree. Evergreen? Tall? Short? Couldn't decide. Couldn't decide all summer﻿. So I put in a few dwarf iris, clematis, cortusa, almost using it as a holding bed until I could figure out where they should really go. 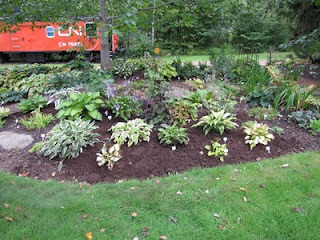 The main hosta bed, that was added to just last spring 2010 (grasses moved), had become too crowded. 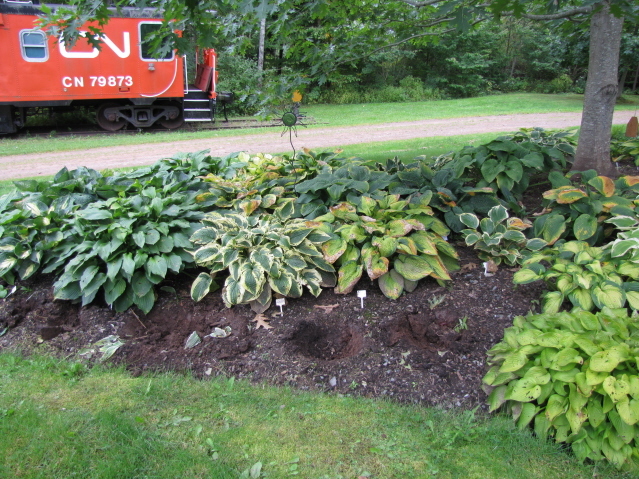 One hosta just blended into another. They needed spacing. And because there were many very large ones (ie: T-Rex, Bressingham Blue, Big Daddy) in the middle and small (not mini) around the edge, the bed looked lopsided.﻿ I had toyed around with the idea of moving hosta that preferred more sun to that bed out front (ie: Pedmont Gold, August Moon,). That bed does get more sun but I have a Kentucky Coffee Bean tree at the corner of the garden that in just a few years will cast a lot of shade on the area anyway. 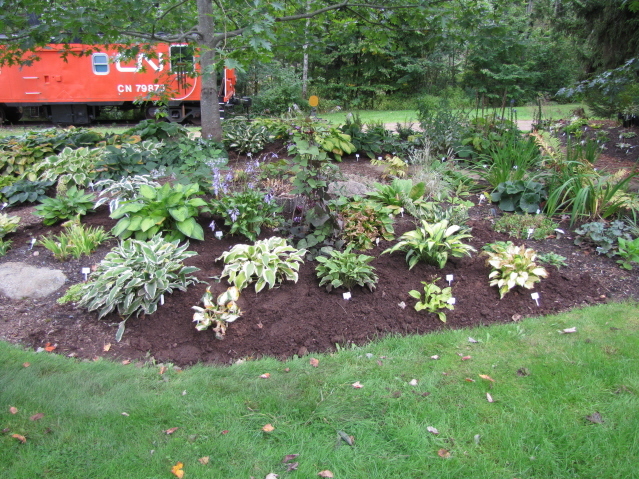 Now for the large hosta bed. It looks like Swiss cheese around the edge. All but 3-4 needed to be plucked out and shifted even a few inches, I tried to ﻿alternate the blue and solid coloured ones with the variegated types. There, much better. But I bet that by next summer it will need to be done again. Some of those Blues have not reached their full potential yet. 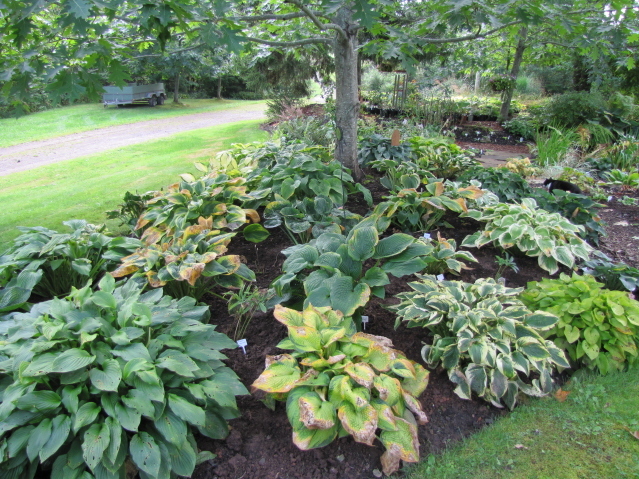 There were still 2 large hosta in the upper garden that I could not﻿ accommodate in this bed. If I expand it, it will be on the lower side toward the road. But that is enough for this year. 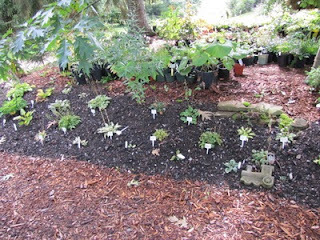 Yet the grass and daylily bed is getting a bit crowded and I do have new acquisitions of grasses to find homes for.